Guests Want to Check In And Bypass The Frontdesk! While 79% of business travelers owning a Smartphone would use it to check in or out of a hotel using the hotel mobile app or web page (Carlson Wagonlit Travel Survey May 2013), most hotels today do not offer the service. Why is that? While airlines started to offer boarding cards on smartphones a few years back, at first that was it you were traveling with hand baggage only, now some airports and airlines also offer a fully automated “checked baggage process”. Yes it does take some of the vacation glamour out of your vacation trip. The business traveller however is not looking for the glamour, and just wants to get from point A to point B without the hassle of waiting in often very long lines. So by introducing an automated checked luggage system, airline passengers can now use the Smartphone for the entire process. Another good example for creating better efficiency is Enterprise rental cars. While being one of the few rental car companies actually walking customers to their car and do a joint inspection, providing a more personalized experience, today’s customer sometimes perceive it as slow service while to Enterprise it add’s costly labor. Recently Enterprise switched the paper part to an iPad, now both staff and customer walk to the car, all paperwork is done electronically, the guest signs on the iPad… and off they go, dramatically speeding up the process. Restaurants, airlines, rental cars all offer smartphone services for their guests. Why is it that hotels do not offer a 100% seamless check in process for guests who want to use their Smartphone? Hotels have a few obstacles to overcome. There is the issue of having good wireless and/or cellular access throughout the property, secondly having a property management system that either offers a mobile solution or integrates nicely with a guest app solution, and lastly there is the issue of getting the guest the room key. The issue of wireless access is largely resolved, many hotels today have wi-fi and or wireless extenders installed to enable coverage around the hotel in the public spaces and guest rooms, and while on their way to the hotel 3G or 4G works great. A bigger problem is the property management system in the hotel. It’s usually older, resides hidden deep in the basement of the hotel, so difficult to access. Build in the 90-ties, the Property Management System (PMS) does not have mobile features build in, and for third party guest app solutions to connect to it, is also a very complex and time consuming exercise. In order to take advantage of the mobile opportunities guests will come to expect soon, hotels must consider upgrading their systems to a more recent hosted or cloud based PMS. Hosted or cloud based PMS solutions remove the physical limitation for guest app’s to connect to the PMS. As the PMS resides in the cloud it can be accessed from virtually anywhere. When deciding on a cloud based PMS, hoteliers should make sure the vendor provides an open and easy to integrate API infrastructure, ideally with very low cost and effort to connect. Alternatively look for a vendor that provides one platform for both hotel staff and guest mobility and can easily integrate with the existing PMS. Lastly, the room key; hotels should think about making a small investment to upgrade their guest room door locks to support RFID, NFC or an acoustic key, or alternatively provide for a simple room key dispenser located in the lobby close to the lifts. This so that hotels can get away from web checkin by which guests still have to collect the key from the front desk. 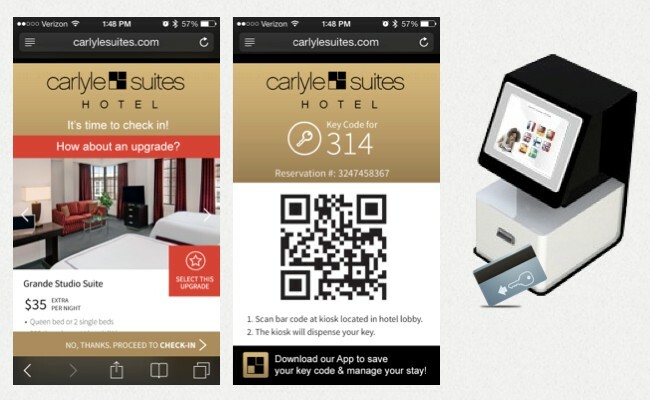 Hotels with RFID, NFC or acoustic key’s can enable guests to use their smartphone as the room key. While the room key dispenser close by the lobby lift, is a great way of delivering a room key to the guest, using a sort of “boarding card confirmation”, once checked in, the guest will receive a email and QR/barcode which can be hold in front of the key dispenser to deliver the guest his or her key. The technologies to provide a connected and guest service oriented check in experience entirely managed from the guests smartphone are all available today, they can also help increase the hotels bottom line, even with taking the cost of software and door lock systems into account. Now is a good time for hoteliers to establish and implement a rich mobile check in and guest experience. By Jos Schaap, CEO and Founder at StayNTouch.